A fairy tale, Essaouira style! It was something out of a fairy tale. A magical little place. A hidden cave on a tiny Essaouira street. 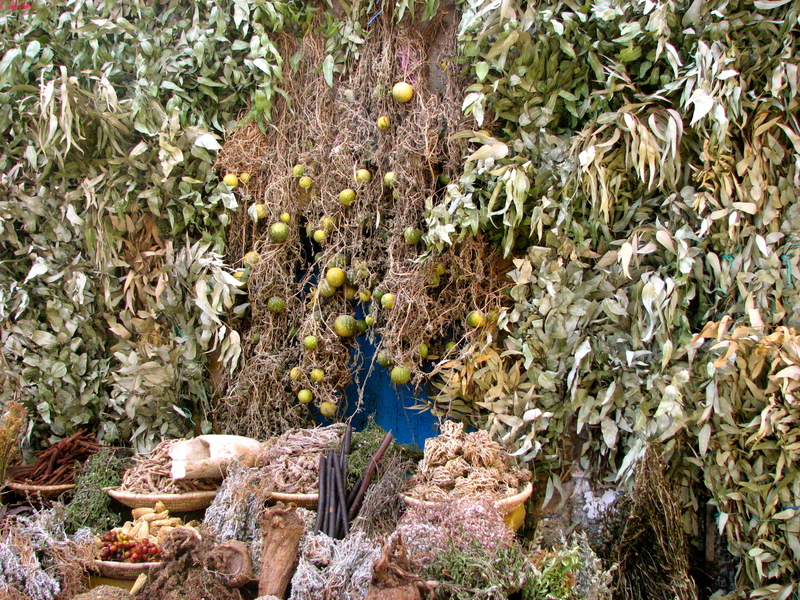 A shop where spices, herbs, dried “stuff” were available for purchase outside. And step inside where the herbs dry on one side of the shop. On the other side, the prepared remedies. For all kinds of treatments. Diabetes. Stomach problems. Of course, argan nuts provided the natural flooring. And the main character: a man in a long black jeleba. Also known as the herbalist. Someone to explain everything. She’d always been a believer in natural remedies, having spent many Saturday mornings working with a naturopath to cure various health concerns. So when she stumbled upon this place as night was falling and her stomach was telling her she had to eat something, she just couldn’t bring herself leave. Smelling natural fragrances like amber, musk and jasmine. Trying out argan oil on her freshly sun-kissed skin after a day at the ocean. Sampling fresh spices for the tajines she would prepare. And learning about the new argan products she’d try out at the hammam. You see argan trees only grows in southern Morocco and the oil from the nut is known for its absolutely amazing properties, both cosmetic and culinary. And the place to buy it is Essaouira. By the time she finally pulled herself away from the shop, she was once again amazed at the magic of the country. She’d found a new interest. After all, it’s the magic that draws her to the Kingdom. Here’s hoping you find some magic in your day! I love all your posts and adventures… this one especially. Each time i’ve been to Morocco, the food I eat with my husbands family has given me trouble with my stomach and they get me something from the pharmacy to help stop the intestinal problems. I only wish I knew what to take ahead of time to prevent this. and what causes my stomach distress so I can prevent it.. The food seems to have a LOT of flavor to it, it is a yellowish orange herb that is used for most of the tangine meals and other meals too. Do you have any idea what it might be? I am thinking either turmeric or cumin! Look out for a yellow colorant, used in place of saffron. Cumin is very good for the stomach and a teaspoon of cumin followed by water typically relieves an upset stomach.